i want to transfer my files from an undetected hdd to another working hdd. how much should I pay for walking through the process? Good morning from the USA (local time 00:17). Welcome to JustAnswer. In order to give you good advice on this situation I'll need to ask you some questions about the hardware and and the desired results. The problem statement says that the source drive is "undetected." Is the source drive an internal drive directly connected to the system's motherboard, or is it an external USB drive? OK. Does the system make any indication that the drive has been connected to the system when the drive is plugged in? can i explain on why i think it's broken? Thank you. I am going to go out on a limb here a bit and say that it sounds like the USB drive enclosure's interface board has failed. Any information you can give me will be helpful. Your analysis is correct and your troubleshooting is exactly what I would have suggested. I believe that what has happened is that the USB interface board inside the enclosure -- not the drive itself -- has failed. If this is the case, then the information on the drive is still intact and so is the drive itself. The situation should be repairable by removing the drive from the enclosure and installing it into a new enclosure. Did you want to attempt this repair yourself, or have someone do it for you? ohh.. you mean the files are still there? Yes, if the drive has not been damaged, then all the files on it should be intact. will my attempt damage the files? I have some saved information on how to deal with this situation. Let me bring that into this session. You can then have a look at it, and see whether you want to proceed with this yourself, or have someone do the repair for you. The most likely explanation for this problem is that the external enclosure's USB interface has failed. This is the most common failure in external USB drives, it does not affect the data on the drive, and it can be easily solved. Depending on how comfortable you are with working on computer hardware, there are two solutions - the "I'll pay to have it done" and the "I'll do it myself" solutions. There is also the "It's under warranty" non-solution, which is described at the end. Take the drive to a local computer repair shop (a locally owned store, not a computer superstore). Explain the problem. Ask them to remove the drive from the enclosure, test it, and install it in a new enclosure. This should run $US 70 to $US 150, depending on how hard it is to get the drive out of the enclosure. The result is the same drive with all the same data in a new, working enclosure. To prevent tampering with the drive, USB drive enclosures are designed to be anywhere from difficult to impossible to open. Generally they must be cut open. Using a Dremel tool with a circular saw blade, and with extreme care, cut the external enclosure in half along the longest axis. This should reveal the internal structure of the enclosure. Now cut the enclosure away until it is possible to unplug the hard drive from the sockets on the USB converter board. On some enclosures, an alternate approach is to pop the case open along the case seam using a sharp flat blade screwdriver. Once the enclosure is open, remove the hard drive. Test the drive in a working system to confirm that the drive is working. When it is confirmed that the drive is still working, order a replacement enclosure from Newegg ($US 40 or so), ebay ($US 15 or so) or your preferred hardware vendor. Insert the drive into the new enclosure. The result is the same drive with all the same data in a new, working enclosure. If the drive is still under warranty, it can be returned to the manufacturer. You will get back either a new unit or a refurbished unit, but it will not have your disk drive in it. The drive in it may or may not be erased, depending on the scruples of the manufacturer. If recovery of the data on your drive is required, you must extract the drive and do the recovery yourself, which will void the warranty. This is unfortunate but unavoidable. Let me know when you've read the above and we'll consider what approach is best for you. OK. Then it comes down to removing the drive yourself or having the job done for you. not sure if WD service center in Jakarta will accept it.. anyway.. i just want the files.. I think the simplest approach is to take it to a reputable local repair shop, explain the situation, and have them break open the case and put the drive into a new enclosure. This should cost less than $US 100. Given that you are in an area where labor rates are not going to be as high as they are in the US, I suspect that the job can be done for closer to $US 50. That is consistent with the enclosure's USB interface failing. The drive is OK but there is no way to get data out of it until it is installed into a new enclosure. This is a common enough problem that any computer repair shop will know how to deal with it, and they will also be able to test the drive once it is removed from the failed enclosure. Given that the drive is spinning (you can feel the humming of the case) I believe the chances are well about 90% that replacing the drive into a new case will solve the issue. "I have a failed USB external drive. The drive appears to be intact but the enclosure does not show up on any system. What will it cost to have the drive extracted and installed into a new enclosure?" The service is going to be the same no matter where you take it, so there's no reason to avoid taking the lowest quote unless it is ridiculously low. Do you have any questions at this point, or is anything unclear? Don't hesitate to ask any question you may have; my time is yours for as long as you need it. so u think i can also bring my other HDD and get it repaired too, right? If the other drive is behaving the same way, then it should be possible to do the same service for that one. The repair shop should be advised to check the drive for functionality before installing it into a new enclosure, just in case it is the drive which has failed and not the USB interface card in the enclosure. ok. i have another question. do u think it's not save to attach the hdd to tv? what is the best practice, because now all tv has usb drive and it's convenient to watch from tv instead of from laptop? do you have any advice? I see no reason to avoid using the drive on the TV. If the drive is not used to its fullest capability, then you are not getting your money's worth from it. There is no technical reason why connecting the drive to a TV should cause problems. but i got 2 HDD damage already.. is there any limit on how long it can be plugged to a tv? i mean, i plug my usb to my laptop like almost 24 hrs, but nothing's wrong happen.. why this hdd was broken? is it because too long plugged into tv? or is it becos when tv went on and off, it's still attached? The weak point in most external drives appears to be the USB interface card. In the external drives I have broken open for repair, those card seem to be built to a standard which is ... well, the construction quality is usually less than the quality of the drive that they are connected to. My own theory is that those little boards are just plain prone to failure. It does not help that the power supplies provided with most external drives are not the best quality. I think better power supplies would solve some of those issues, but this does not appear likely. I have a couple external drives attached to my PC and also to my TV. The drives seem to be very reliable but the enclosure electronics are prone to failure. It appears to be something we'll have to live with unless the industry decides to build better quality interface boards and provide better power supplies. I recommend that you get your drives replaced into new enclosures, and worry about failures if and when that problem actually presents itself. Let me see if I can find a picture. In this case a picture will be worth more than a long explanation. Click anywhere on the image above to see it at full scale. 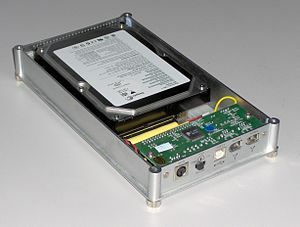 Looking at the image above, we see that the enclosure has a standard hard drive inside it. Note the small green circuit board near the end. This is the USB interface board. It converts USB signals to a form that the disk drive can understand. This is almost always where the problem is. Anything failing on that board means that the enclosure won't be visible to the computer, TV, or whatever the enclosure is plugged into. The drive is still OK, but if the interface fails that doesn't matter. It's my pleasure, and you're very welcome. Is there anything else that is unclear? how to save the chat? I'm glad to hear that. Is there any other computer-related problem I might be able to help with today? If not, let me know and I will bring in the closing information so that I do not delay you unnecessarily. OK. I will bring in the closing information so that you can close this question. You will not be charged until you accept this as an answer. you mean i can go back here after i bring my hdd to the service point? You can return here for about two weeks after this question is closed. This allows you to deal with any issues that may come up unexpectedly. After some time, the question will be permanently closed and archived. I have several programs, ie. MS Office, Adobe Acrobat, etc.